Mon - AM: 8 miles (1,900') easy. Horsetooth north summit via north gap. Tired. Tues - AM: 10.5 miles intervals. Workout was: mile, 800, 800, mile, 800, 800, 2 mile fartlek (all cemetery, except the two mile, which was City Park route) with 2 - 3 min standing rest between. Mike, Brian and Garcia to work with this morning. Ran pretty much as a pack for the first half and then I tagged onto Garcia's coattails for the rest. This seemed like the first really good morning for running we've had at Jane's all fall/winter/spring, and for whatever reason the running felt really good. First mile as always served as a warm-up, and felt pretty casual, so I was pleased to see a 5:25, then went 2:36, 2:37, 5:15, 2:38, 2:38, 11:13 (5k/marathon effort on the hard/easy). For as comfortable as these reps felt, I was super stoked with this workout. I've kind of been slogging through these intervals all winter a little frustrated with the effort/result, so today felt like a mini breakthrough. I didn't feel like I was overexerting and the numbers came in a little better than they have been. I'm going to call that progress. In other news, Jane Welzel - who organizes these workouts and the Tuesday Night Track workouts in the summer - was recently inducted into the Colorado Running Hall of Fame. I can't think of a more deserving person in the Fort Collins Running community for this honor. Not only is Jane a five-time Olympic Trials Qualifier ('84-'00) with a 2:33 PR and a former U.S. national champ in the marathon, but she is also a tireless supporter of the local running scene with an enduring passion for the sport that many a former elite would find hard to match. I think it would be fair to say that Jane serves as a huge inspiration to many a runner in Fort Collins, myself included. Very well deserved, Jane. Congrats! Jane crushing it at the CSU track on a Tuesday Night. Photo pilfered from The Coloradoan. See the Q&A here. PM: 5 miles (1,100') easy. Falls loop. Tired, but had to push a bit as I was under the gun to get the kids off to activities. Weds - AM: 8 miles (1,900') easy. Horsetooth north summit via north gap. Killer inversion morning, with Milner's summit just poking up above the clouds and Longs basking in full morning sun high above the cloud base. Lingered on top for a good 10 minutes soaking it in. Thurs - AM: 10 miles (1,400') hill tempo. Centennial out and back with Mary, Celeste and Ziggy. Back in 31:30 at a good steady effort. Feeling a little tired, though. PM: 7 miles (1,700') steady. First time back on Towers in a while. Good turnout for the first spring session of the year - probably 25-30 on the hill. Feeling kinda sluggish from the morning session, I started out jogging and eased into a tempo kind of effort by halfway. Ended up running 32:30, which ain't too shabby given the relative effort and heavy legs. Fri - Noon: 8.5 miles (2,200') easy. Horsetooth north summit (South/Audra/Gap/Wathan) with an out of shape Stefanovic. Good to get back on the hill with Bryan. Sat - AM: 19.5 miles (5,200') easy. 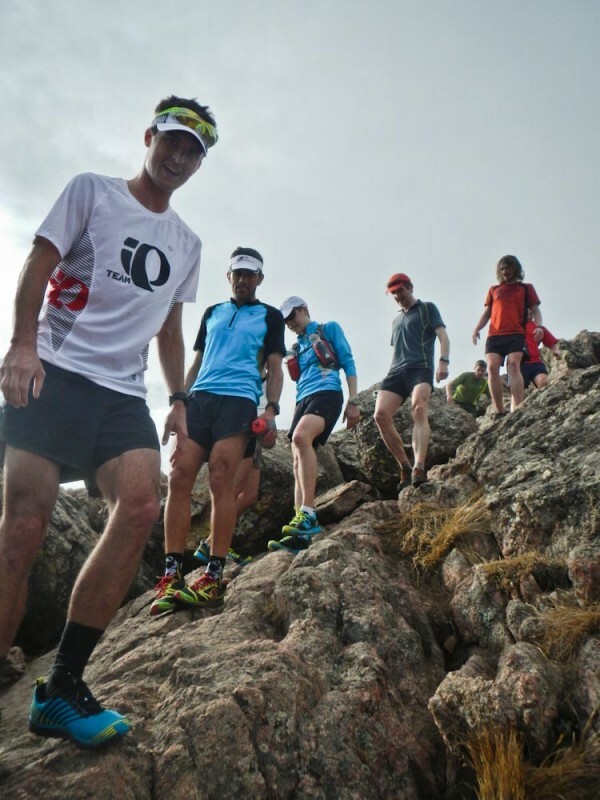 Quad Rock training run. We got a great day for running and a decent one for hanging out; we did both in great style. Had a good 50 - 60 runners show up for the run, with an impressively big group on the Horsetooth north summit on the first lap. I ran a loop and a half, then tended to all things barbecue. Fun times. First Endurance and Pearl Izumi supported the run. Mary Boyts, an integral part of the Quad Rock team, tries on a pair of PURPLE Trail N1s! All above pics, Shannon Price. Sun - 15 miles easy/steady. Up early to mark the Tortoise and Hare 12k course, then another 8 miles between 6:30 and 7:00 pace on the bike paths. Last race of the 2012/13 season - been a good one with record attendance. First and second today (actual time) were Karen and Sarah: showing the boys how to get it done. Another week in the books, and it was good one. Despite feeling a little tired and lackluster, the running came easily enough. A good workout on Tuesday, a strong double hill tempo on Thursday (AM/PM), and a fun hilly Saturday morning in Horsetooth has me feeling decently confident that I can post a PR over in California this weekend at the Lake Sonoma 50. Anything faster than last year (6:49) will be considered a success, and overall placement will take care of itself. I'm guessing a 6:50 or better will be needed for a top 10 spot. If anyone is looking for a place on the Quad Rock 50 start line, we have a couple of people looking to transfer slots, so sign up for the waitlist and you'll get transferred over to the entrant list. In other news, registration for the Bluesky Marathon opens April 15. Pete and I have taken over the management of the event and in celebration of all things Fort Collins trail running, we have decided to DROP the entry fee. We still can't compete with Salida for the state's cheapest marathon, but we're close. A paltry $65 gets you entry if you sign up early. And get this ... we're offering entry into the inaugural Black Squirrel Half Marathon (yes, you read that right) for an additional $34 if you sign up for both at the same time. If my math is correct, that means you get to run the half and full (Black and Blue Double) for under $100. Blimey. We're working on the webpage right now, but Double registration details are available on the Bluesky Website. The date for the BS HM is August 31st and the course is a full outer loop of Lory, heading up Timber and down Howard. Should be a pretty fast course. Care to speculate on the top-3? Lookin forward to the BLACK SQUIRREL!!! You all have way to much fun in Ft Collins. Give the lake hell this weekend! They don't call it Fort Fun for nothing, Jaime. oooo awesome about the Blue Sky Marathon! And congrats to Jane! Jane's awesome. She could just be a fast runner and totally self-absorbed, but instead she kept sharing the gift with her workouts, races, parties, etc. I've read your blog off & on the past year but never commented. A couple things caught me eye this time, so wanted to speak up. First, your comment on the girls stomping the men in the last T&H race was pretty motivating. New goal is making sure that doesn't happen next year. Just a few minutes to cut off the 12k time now. More seriously, I think I speak for all the T&H racers when I say we really appreciate the work you, Connie, and the others do at that series. Also, I've never done a real trail race, but the BS half has me intrigued. You say the course should be "pretty fast", but looking at the description it sounds pretty tough to me. 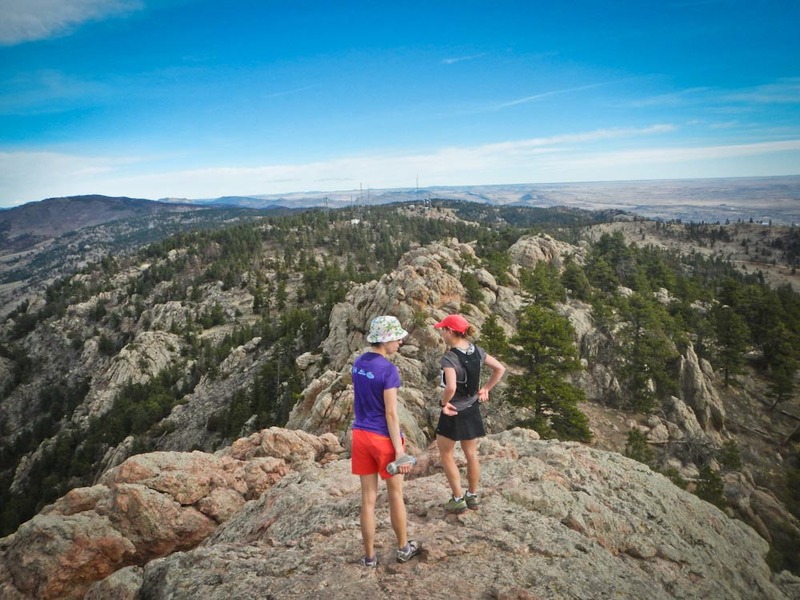 How should it compare to something like the Horsetooth Half? Finally, saw you got 10th at Sonoma, congrats on the race. Only 4 minutes off your PR...sure you wanted better, but 5 sec/mile isn't too far off. I'm sure your readers look forward to the race report. Hey Scott - I always enjoy doing the T&H races and they take very little organizational time, so I'm happy to direct them. It has certainly been gratifying to see the increase in participation the last few cycles. With regards to Black Squirrel and course speediness, I guess all things are relative. Certainly in comparison to a road half marathon it will be a slow course, but relative to other trail half marathons (that have hills) I think it will be reasonably fast. 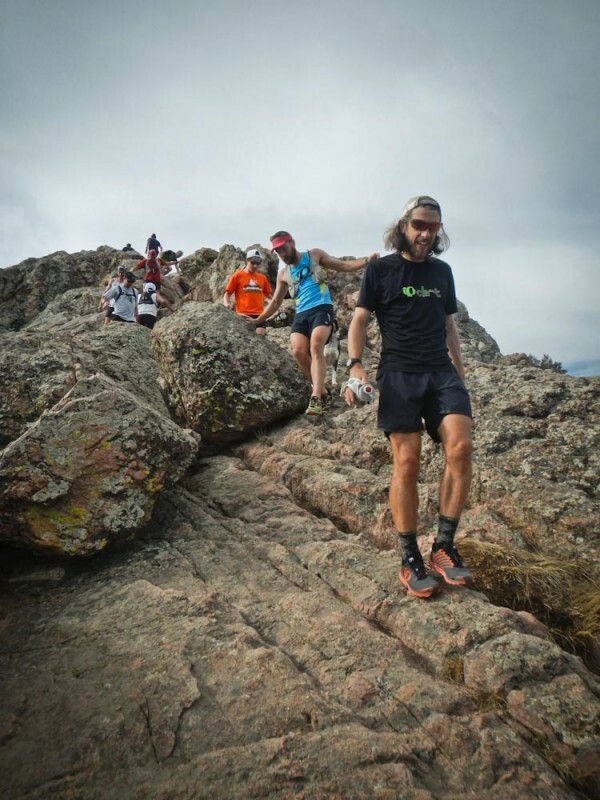 Our goal with that race is to appeal to both seasoned trail runners and those looking to test the waters in trail racing, so it should be a good intro if you do decide to do it. I'd tell you to go check the course out for yourself, but probably not the best timing considering its currently buried under two feet of snow. Lake Sonoma: yeah a reasonable outing, but certainly room for improvement. Race report coming soon. Of all the improvements you'll better have some passion in your work. I admire those people that are behind this successful event.